Welcome to My Creative Time's 12 Days of Christmas Blog Hop! Can you believe that we only have 2 more days!!! We are showcasing projects that are quick and easy or some with more details. We are all SO BUSY these days, so hopefully you can pick up some ideas for this holiday season. You should have arrived here from Linsey's Blog! If not please head over to Emma's for the start! You will want to make sure that you leave a comment for everyone so that you will eligible for the DAILY GIVEAWAYS! That's right DAILY!!! 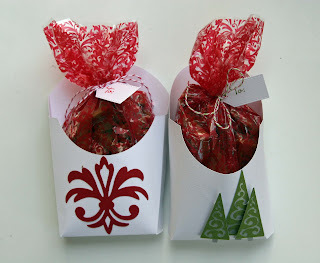 I know that I already told you that I make English Toffee for friends and family earlier this week. However I don't always package everyone's the same way. I used to hand cut these french fry boxes for my candy every year, but not now!!! Now I use Art Philosophy cartridge! I still like to keep them simple and elegant so I just added a florish for one and trees for the other. Both cuts are also from Art Philosophy. Then I just added a tag with "To" stamped on them. 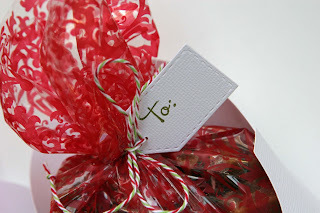 Another quick and easy gift! If you missed my candy recipe the other day, you can click here for it! OMG!!! THAT CANDY LOOKS DELISH!!! TOO BAD YOU ARE NOT COMING TOMORROW OTHERWISE i WOULD'VE ASKED YOU TO BRING SOME!! HEHEHEHE!! YOUR ENTIRE PRESENTATION IS JUST PERFECT MY FRIEND! I love the colors you chose. I made this box last year for xmas and put hot chocolate and candy canes in them. The bag is very cute. This is a great box for your beautiful treat bags!! The trees are my favorite. Super cute box for your English toffe....love the AP cartridge!! Thanks for sharing your recipe. cute, cute, cute treat holders! Your treat holders is too cute!! I love the decorations you used!! Love these french fry holders...perfect little holders for sweets. Oh, these are so cute, Liz! 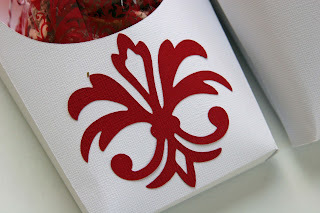 I love the embellishments you made - awesome cuts! What a fun gift! Nice presentation for your candy. Oh so cute,love those trees. Very pretty boxes for your candy. Nice idea. Great idea! I love something that is simple and turns out lovely, like yours! Wow, what a great idea. I just might have to try and cute one of these french fry boxes out. Thanks for sharing. Love the gift box great idea !! Great idea! I love the simplicity of the embellishments...yet so beautiful. I'm partial for the one with the trees for Christmas though! 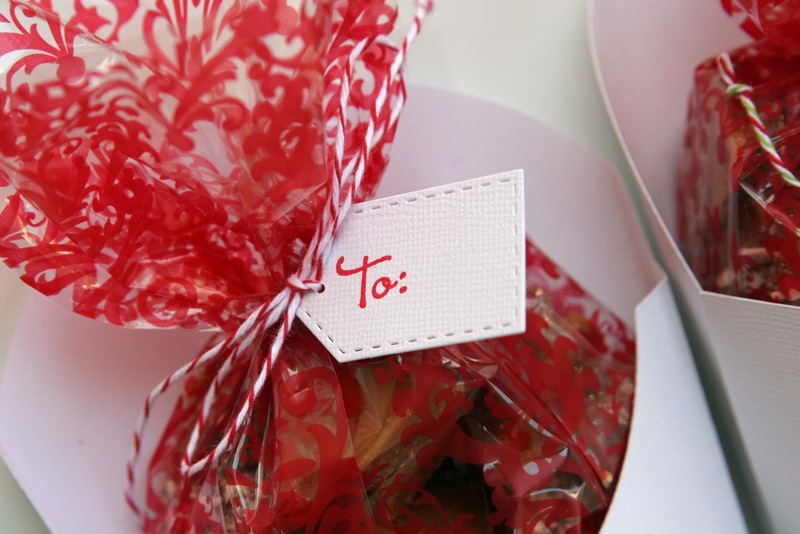 What a Great Idea!Great party favors for my Christmas Party. So pretty!!! LOVE the designs!!! What a great idea. I love the simplicity of it but still so elegant. TFS! I love the french fry boxes! So cute! What a great idea for gifts, so pretty. I love that Art Philosophy cartridge, it's my favorite. Great little candy boxes! TFS! These are lovely and your candy recipe looks yummy too. Cute packaging for a great treat! Cute fries box for your treats. These are wonderful boxes for your Christmas treats. Very cute little boxes and tags!! Awesome job on those boxes!!! Art Philosophy is a fantastic cartridge!! What a wonderful work, such creativity! Love it! Great gift ideal. Great idea - love those little fry boxes. Too cute. Nice paper choice. CUTE CUTE CUTE....ABSOLUTELY LOVE THIS PROJECT!! Nom.. Nom.. Nom.. Looks so pretty and delicious too! Your treat holder is so cute and elegant. Thank you for sharing. Fabulous treat containers. 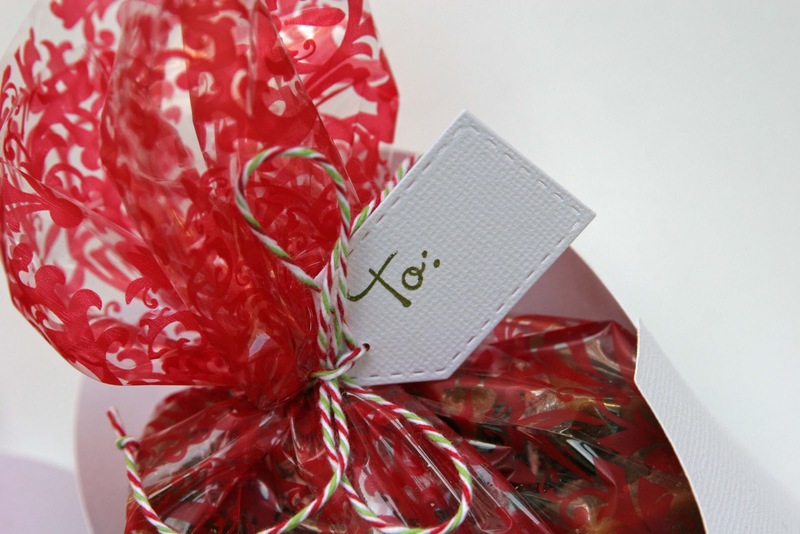 I love the printed cellophane wrap for the inside. Just says, elegant treat holder. Very beautiful. Thanks for share with us. These came out so cute! Can't wait to try! What a cute gift. How do I get on your gift list??? love the fry box and the idea! Very nice! I love the packaging! So pretty! Love this, such a great little gift!! Super pretty boxes for your yummy treats:) TFS! Simply lovely presentation! Beautiful and yummy treat box! Very great idea. I need that cartridge. the ff boxes are very cute great job. I love those little french fry boxes and yours are just the cutest! Now I think I need Art Philosophy! Love the idea of a French fry box for packaging goodies. I will have to get Art Philosphy soon. 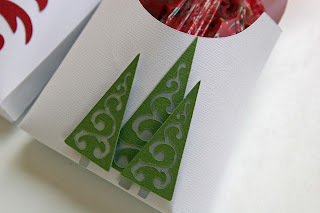 I love those goodie containers, Too darned cute! Really sweet candy in a really sweet box! These are awesome. I really love that french fry box. I love the french fry box, I have to use it for something! TFS. So pretty! Great gifts for the neighbors. Thanks for sharing. I really need this cart! What a cute idea! AW! These are ADORABLE!!! I love the colors. That box is super cute! Lovin' the french fry box idea! I didn't even realize it was on the Art Philosophy cart! guess I need to use that cart more often! Great job! These are beautiful! Awesome job! Thanks for sharing with us! love how simple and elegant these are!! Very pretty...I'm sure your recipients will love them! Super cute, love the french fry box. Thanks for sharing. Great way to give you candy. Cute treat holders! Love those french fry boxes. TFS. loven all the projects, has been a great hop.